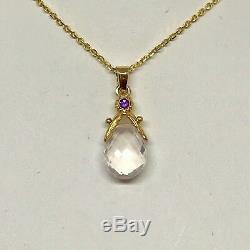 Fantastic pre-owned 14K yellow gold rose quartz and amethyst pendant. 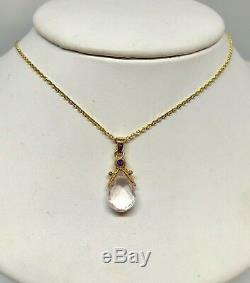 The pendant displays a small round amethyst which is bezel set at the top. 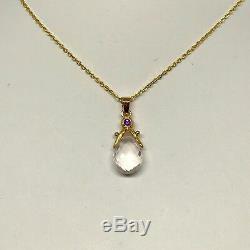 Below the amethyst there is a pear shaped rose quartz which is also faceted. The rose quartz is set on a gold bar which means the stone moves slightly. The pendant is on a 16 fine 14K yellow gold chain with a lobster clasp. This piece will come in a box and gift wrapped. Weight: 2.77 Grams approx. Pendant Measurements: 20mm x 7.94mm approx. Pear Shaped Rose Quartz: 12mm x 5.85mm x 7.94mm approx. 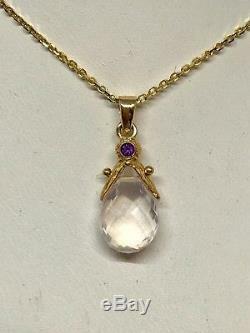 The item "Pre Owned 14K Yellow Gold Pear Shape Rose Quartz & Amethyst Pendant Necklace 16" is in sale since Friday, January 25, 2019. This item is in the category "Jewelry & Watches\Fine Jewelry\Fine Necklaces & Pendants\Gemstone". The seller is "cottagejewelry" and is located in Evanston, Illinois. This item can be shipped to United States, Canada, United Kingdom, Denmark, Romania, Slovakia, Bulgaria, Czech republic, Finland, Hungary, Latvia, Lithuania, Malta, Estonia, Australia, Greece, Portugal, Cyprus, Slovenia, Japan, Sweden, South Korea, Indonesia, Taiwan, Thailand, Belgium, France, Hong Kong, Ireland, Netherlands, Poland, Spain, Italy, Germany, Austria, Bahamas, Israel, Mexico, New Zealand, Philippines, Singapore, Norway, Saudi arabia, United arab emirates, Qatar, Kuwait, Bahrain, Croatia, Malaysia, Chile, Colombia, Costa rica.